Take potatoes and carrots into a Pyrex or oven tray. Sprinkle the half of the salt and drizzle half of the oil. Combine them all and cover the base of the tray with them. Mix tomato paste with the remaining salt and oil. Cover the chicken pieces with this mixture, sprinkle some cumin or black pepper if you like. Then, arrange them over potatoes, place the pepper and tomato slices over. 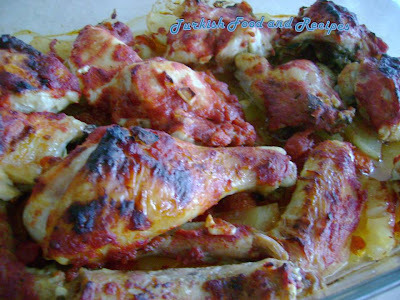 Preheat the oven to 400F (200C) and bake until chicken is cooked, for about 50-60 minutes. 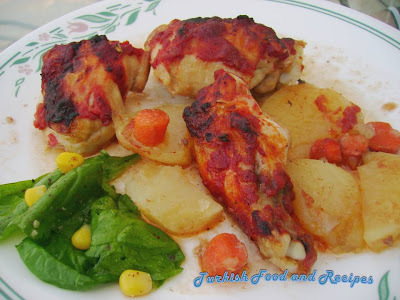 Serve Baked Tomato Chicken warm. Patates ve havuclari genis bir borcam ya da firin tepsisine alin, tuz ve sivi yagin yarisini serpin. Guzelce harmanlayin ve tepsinin dibine yayin. Geri kalan tuz ve sivi yag ile domates salcasini karistirin. Tavuk parcalarini bu karisima bulayin. Isterseniz kimyon veya karabiber serpebilirsiniz. Sonra, tavuk parcalarini patateslerin uzerine yerlestirin. Son olarak, biberleri ve domates dilimlerini yerlestirin. Onceden isitilmis 200C (400F ) firinda tavuklar pisene dek yaklasik 50-60 dakika kadar pisirin. Firinda Domatesli Tavugu sicak servis yapin.